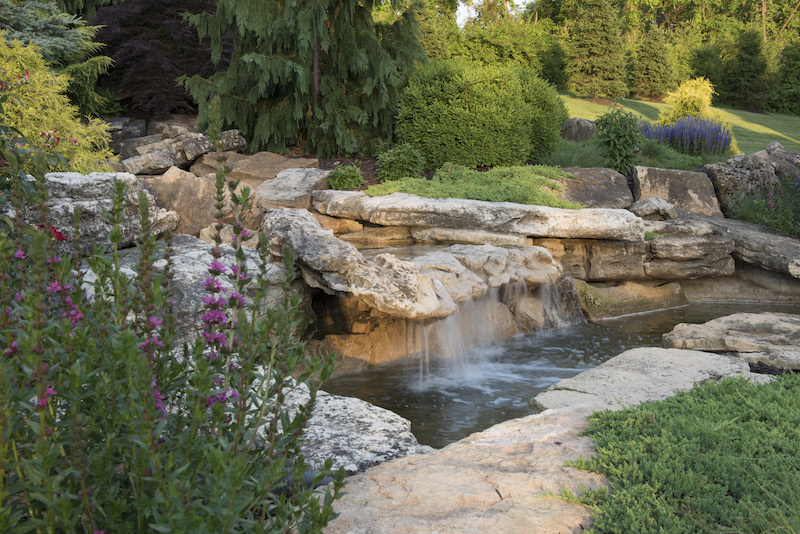 For many homeowners, professional landscaping can be a dramatic lifestyle enhancement, but did you know it can also provide financial, mental, and environmental rewards? Our feature in the February issue of Chesterfield Lifestyle Magazine talks about the economic benefits of landscaping, so we’ve expanded on that by discussing the additional benefits of landscaping below. It turns out, money really does grow on trees. Landscaping is one of few home updates that is proven time and time again to improve value, so it should be considered an investment, not an expense. If properly executed, you should see a return on your landscaping dollars in several different ways. First, landscaping increases your home’s value and boasts an average return on investment of 109%. According to this article in Better Homes and Gardens, “You might figure on investing 5-10 percent of the value of your home on a landscape upgrade and expect to get most of it back right away.” Professionally landscaped properties have curb appeal and appear well-maintained, which makes them more attractive to buyers and helps them sell faster. Something else landscaping has that other home improvements don’t, is increased value over time. The added value attained by landscaping only increases with time as trees and shrubs mature, enhancing their visual appeal. Another way landscaping can be financially rewarding is strategically designed landscaping can reduce utility expenses in the summer and winter months. If you are looking for a tree that will shade your patio just right or block wind, stop by and see us. We’d be happy to show you the right trees for your needs. Did you know just being in the presence of a natural, green environment is brain-healthy? Flowers have long been associated with lifting one’s spirits and gardening and working outdoors have been proven to reduce stress and provide a sense of calm and accomplishment, but you don’t even have to do anything to reap the mental rewards of landscaping. According to a Texas A&M study, simply being surrounded by plant life can positively influence your work and mental well-being. “The calming influence of natural environments is conducive to positive work environments by increasing a person’s ability to concentrate on the task at hand. Work performed under the natural influence of ornamental plants is normally of higher quality and completed with a much higher accuracy rate than work done in environments devoid of nature. The influence of plants can increase memory retention up to twenty percent, stimulating the senses and improving mental cognition and performance.” Doesn’t this make you want to move your office outdoors in the spring? If you need another excuse to have your yard professionally landscaped, we have a bonus for you. Did you know that landscaping is helpful for the environment? That large shade tree that is regulating your home’s temperature is not only saving you money on the electric bill, it is also conserving energy. Roots are a natural filter for rainwater, helping to reduce water pollution while controlling erosion and plants clean our air by filtering out carbon dioxide. Let’s not forget our wild furry (or feathered) friends. Adding trees and shrubs will give wildlife a warm home, protection from the elements, and a secure place to hide from predators. Now that you know all the benefits that landscaping can provide, if you are interested in learning more, please give us a call or stop by with any questions. If you are interested in a landscape consultation, click here.